See the New Updated YLRL.org Website! Join or Renew Online through the New YLRL Website! If you have not yet joined or renewed for 2019, it is now easier than ever to join and pay your dues online through the NEW www.ylrl.org website! 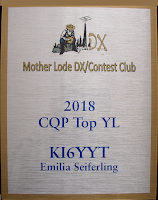 Your membership supports the YLRL mission to encourage and assist women and young ladies throughout the world to participate in amateur radio through YL contests, YL nets, member news in our bi-monthly newsletter YL Harmonics and scholarships for young ladies who pursue studies in electronics, communications or related areas. While your at it, would you send a paragraph or two (and a photo if available) about yourself and your activities to me at district6@ylrl.org for inclusion in an upcoming YL Harmonics? 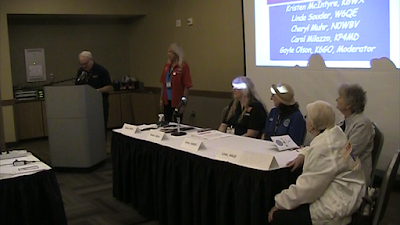 The YL Forum was held at the 2019 International DX Convention in Visalia, California on Saturday April 13 at 1:00 pm for all YL amateur radio operators and members of YL groups and friends. The speaker panel of Kristen McIntyre, K6WX, Cheryl Muhr, NØWBV, Linda Souder, W6QE, Violet Barrett, W6CBA, and chaired by Gayle Jacobs Olson, K6GO, introduced themselves and entertained questions from the audience. Topics on a range of issues on a range of issues were discussed including: a history of the YL forum, a YLRL website update, YL nets on the air and EchoLink, and ways to encourage more YL participation in amateur radio. In attendance were: Mike Binder, NA6MB, Magda Tamulski, KM6KSN, Ingrid Geissler, W7ISG, Nick Rodillas, N6RND, Bob Grubic, NC6Q, Timothy Everingham, N6CUX, Vicki Zumwalt, N6KLS, Jennifer Selbrede, K6ZED, Leida Erickson, N6MXC, Marilyn Konold, KB6KKU, Michelle Thompson, W5NYV, Paul Williamson, KB5MU, Michael Kalter, W8CI, Valerie Pigott, K7VAP, Gary Grant, KC7CS, Grace Foster, W6ULW, John Foster, N6FVY, Joanna Dilley, K6YL, Dennis Vernacchia, N6KI, Carolyn Wilson, K6TKD, Jim Idelson, K1IR, Cathy Gardenias, K6VC, Beckie Kendrick, K6RI, Carl Gardenias, WU6D, Karen Isaacson, KK6SID, Brian Leverich, WA6I, David Bartholomew, AD7DB, Emma Ronney, KG6MFC, Kyle Bixler, NN0X, Dr. Emilia Seiferling, KI6YYT, Irene Brown, N6OU, John Muhr, KT0F, Anna Sombor, W6NN, and Carol Milazzo, KP4MD. Photo Album. A video of the YL forum is posted on YouTube. 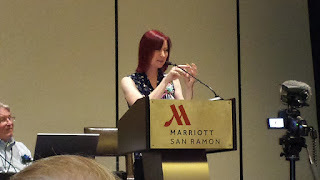 At the convention, Kristen McIntyre, K6WX, also presented her technical forum "Not So Basic Antennas"--an overview of all types of antennas and their particular applications in amateur radio. 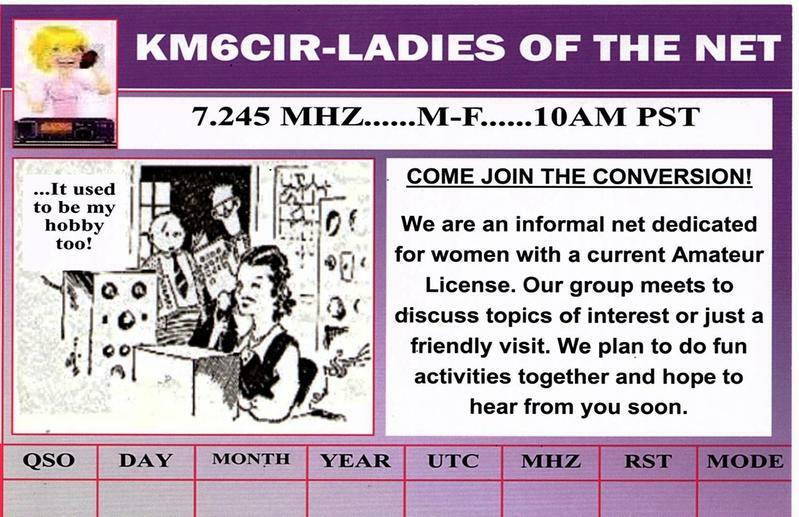 I belong to a local Ham Radio Club in San Bruno, CA. We meet monthly in the EOC, (Emergency Operations Center) and conduct a weekly net on 2 meters. We focus mainly on disaster communication preparedness since we live in earthquake country! California has also suffered many major fires in which phones, electricity, Internet were nonoperational and ham radio was the only means of communications. In some cases even the repeaters were down. San Mateo County recently conducted a simplex drill to address this very problem. Participants checked in to Net Control on a repeater and then switched to a simplex frequency to read a script. Others rated their signal strength and readability. Our county has many hills, canyons and low spots, so this was a a good exercise. One of the highlights of our Club was participating in a contact between the International Space Station and a local middle school in San Bruno. Another local radio club and many other hams set up the necessary equipment to make the contact 250 miles above the earth. The entire student body was present as contact was made with Capt. Scott Tingle, KG5NZA. Some students in the school's radio club had questions ready to ask Capt. Tingle concerning life on the Space Station. Unfortunately the contact only lasted 11 minutes before the Station flew out of range but it was an experience the students won't soon forget. Kristen McIntyre, K6WX, is literally in the center of the Silicon Valley, a senior software engineer at Apple, after spending years in Japan as an entrepreneur. 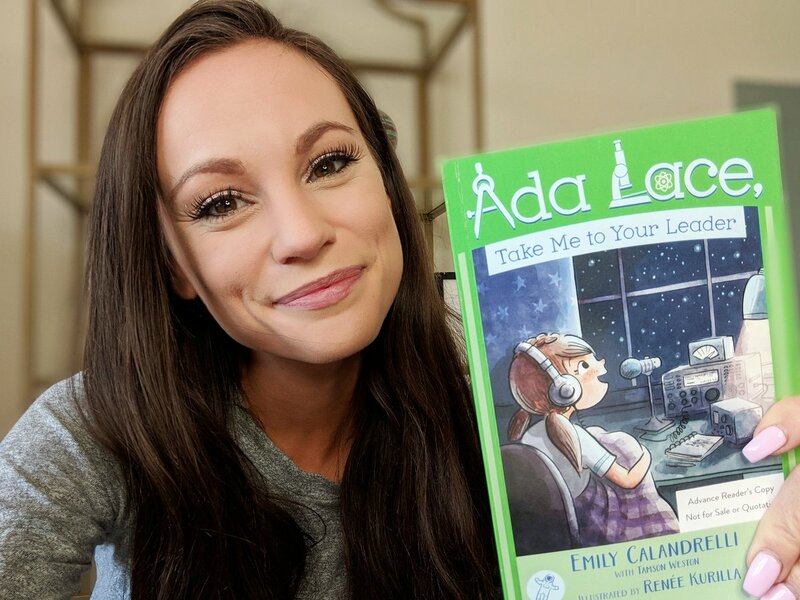 Her resume has her doing just about everything in electronics in addition to supporting STEM programs that encourage kids into studying for the sciences. She is the president of the Palo Alto Amateur Radio Association, and she is a ARRL Pacific Division Vice Director. Kristen writes a monthly column for Nuts and Volts magazine. She was recently inducted into the CQ Amateur Radio Hall of Fame. We operated portable in Solano county about two miles from our house in a quiet RFI spot. We were set up in our tiny trailer, a MeerKat. We got the trailer to do exactly this sort of radio operation. Last year I got fourth place so I decided to go for a better placement this year. I was really surprised to get first. Some one in a better location could do the same thing. You just have to submit your log! If you put this in the YLRL Harmonics, maybe it will encourage other YLs to participate in their state QSO Party. 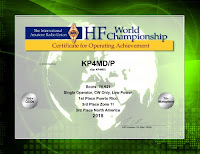 2018 was my second consecutive entry in the IARU HF World Championship from my beach front vacation condo in Puerto Rico. I opted to forego the frustration that QRP'ers face with compromise antennas and dismal propagation, so I added the KXPA100 amplifier to the KX3 transceiver and the Buddistick antenna on the balcony. Prior WSPR station spot data again helped optimize my operating and rest times to maximize the QSO yield. I was rewarded with 1st Place Puerto Rico and 3rd Place Zone 11 and North America in the CW Low Power Category! KM6CIR Ladies of the Net is excited to announce that our first get together of 2019 will be April 27th and 28th!! We will meet for lunch on Saturday, April 27 between 12:00 - 1:00 pm at the Solvang Restaurant, 1672 Copenhagen Dr., Solvang, CA 93463. The nearby hotels are: Hotel Corque (805) 688-8000; King Frederik Inn (805) 688-5515; and Wine Valley Inn & Cottages (805) 688-2111. They are all within walking distance of the Solvang Restaurant and are all located near the stores for our shopping spree. Come join us for this fun weekend in Solvang. Join the net every Monday - Thursday at 10am PST and help plan the itinerary!! 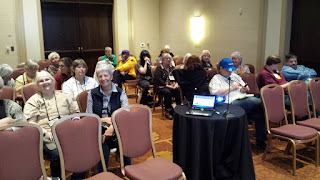 Women amateur radio operators of all ages (YLs) and members of YL clubs and groups attended the YLRL Forum at the 2018 ‪‎ARRL‬ Pacificon Division Convention. The forum was held on Saturday October 20 from 3-5 pm at the San Ramon Marriott. Following introductions of the attendees and a welcome by YLRL District Chairwoman Dr. Carol Milazzo, KP4MD, Convention Keynote speaker Jeri Ellsworth, AI6TK started with a talk on her success in amateur radio and other male-dominated fields. The forum continued with slide shows of the year's YL events including the Ladies of the Net Visit to the Jelly Belly Factory, Activation of the USS Lucid Museum Ship Radio Station, and photos from the 2018 YLRL Convention. Attendees shared in a thoroughly enjoyable discussion of their experiences, strategies, challenges, and accomplishments in amateur radio. We conducted a very well received amateur radio booth at the Girl Scouts Heart of Central California STEM Expo in Sacramento. We plan another hands-on operational amateur radio station at the March 2 Placer County STEM Expo in Rocklin with youth oriented literature about amateur radio, the YLRL, Radio Scouting, and the Girl Scouts Radio and Wireless Technology Patch Program. Please contact Carol KP4MD at district6@ylrl.org if you wish to participate or need assistance, literature or resources for a local event.